The U.S. stands alone… but, no longer as a beacon for transportation. As one of the best tools to cope with urban congestion, commuter train modernization is accelerating worldwide… except in the U.S. As the key infrastructure showcasing its industrial might in this century, China’s inter-city trains soon will rival Japan’s. Curiously, Japan’s commuter rail remains the world leader for five decades because the rail companies frequently owned the land around the stations. This synergy is what the U.S. has lost and restricts our urban redevelopment. By modernizing policy, Europe largely has modernized its regional mobility. Their decades-proven formula starts by updating stations into destinations or malls, converts terminals into through-stations, redevelops nearby buildings and, as ridership grows, improving frequency and the quality of trainsets. Showing healthy transportation economics, most of these countries subsidize the car less and charge it higher user fees than the U.S. Attention to policy pays off. For example, this assertive pattern modernized Paris regional trains so much that they have 712% more passengers than similar-sized Chicagoland, the U.S. rail center and annual contender for America’s largest commuter system… but whose ridership growth is stagnant relative to population growth. Explanation? Starting in 1969 and finishing by 1982, Paris’ system tunneled under four of its six terminals, converting them into through-stations while making seven new stations. All these assets were combined into one regional network that served to re-generate the inner-city and reduce stresses on the subway and surface streets. As contrast, Chicago in 1984 started talking about connecting two terminals. Since then, we’ve spent lots renovating terminals, but built zero new inner-city stations. While lacking the authority of law, a 2010 consensus Plan at least made a top regional priority of converting two adjacent terminals into through-stations. While Europeans know they can do this, no Chicagoans I know honestly believe there are funds for this game- changing tunnel … despite it being short and offering a high return on public investment. Paris achieved in 13 years what Chicagoland officials only could talk about for 33. And what is the cost of talk? A Paris-quality train modernization is required for Chicagoland to compete in the global era. Only now, those mobility efficiencies will require the metro to invest at least twice as much in real dollars as Paris did. While Chicagoland’s backwardness may seem extreme, it describes the U.S. pattern of almost no progress. Progress is prevented by governments we keep supporting. But, they no longer support us. The longer we wait to fix our trains, the more expensive the fix. Trains remain our leading technological antidote to regional car congestion. We start with the positives. Americans are good at redeveloping property near stations. Chicago, Boston, DC, San Francisco and Manhattan’s Westside are all improving real estate within walking distance of their central terminals. Many are magnificent buildings that help shape desirable urban settings. All these talents need to be applied to redevelop sub-regional centers. However if we analyze why those talents spread too slowly, we can accelerate sub-center regeneration. Progress in urban real estate is rarely served by transit adequate enough for smart growth. Improving transit is secondary and, typically, gets sacrificed from plans. Agencies often neglect to improve — and probably cannot improve adequately — their transit networks. Central terminals remain so. Capacity does not keep pace with growth. Car congestion in the downtown — and the roads leading there — persists. So to advance this essay, let’s cut-to-the-chase and ask this question. Since their purpose is to serve as a transportation hub, why can’t American terminals convert to the 21st Century standard of a through-station? You know the answer: Mayors control land use and do so to gain their cities short-term revenue by improving buildings near stations. Yet, urban mayors cannot modernize train networks to increase capacity and, thus, cannot redevelop network sub-centers or their potential long-term tax revenue. And why can Europe? Because one agency typically has superior authority; guiding other agencies to work in synergy. Thus trains, one of our best technologies to decrease highway and subway congestion is under-utilized. Also lost is a key tool to increase value in the network’s sub-centers. How to utilize trains better is a theme of “What Stations Teach.” To organize this nutshell, Preview B has a first grouping that includes the transit start-ups of the Twin Cities, Denver, San Jose and LA. All impressively are improving real estate around their station. But with too little transit at the end of the 20th Century, these cities struggle to improve transit service enough to get commuters out of their cars. The key question revolves around economic incentives: how can a region invest new capital smarter so its trains gain enough market share to reduce car congestion? More and more advocates argue this answer: if transit were funded more by car usage fees and, thus, leveled the subsidy playing field, then commuters would take transit. Our charge: rebalance the economic incentives. Intuitively, many also know this sustainable transportation “formula” has the same strategic solution: move toward a regional governance that increases transit effectiveness by increasing usage fees until congestion is tolerable. While it will have real estate success, 30th Street teaches us key factors in improving regional transportation. In The Big Picture, clear majorities of American urban dwellers want car congestion reduced. Yet, Philly’s 26% who take transit to work has hovered around that for two Census. Why? Well… Philly’s metro has not changed how it uses trains to get its taxpayers to work. Without an increase in regional authority, the 30th Street “Plan” is mostly likely to bring far more cars to what is now an extension of Philly’s Center City. So… even America’s only through-station will not reduce congestion because the Philly metro lacks proper authority to develop economic incentives to reduce car usage. So goes the story with stations in the next five chapters. Similar to 30th Street, they had under-utilized rail yards and rebuilt them as mixed use developments that extend the urban core. And all have a marginal reduction in road congestion because a big city mayor cannot make the most effective changes in overall transportation policy. Hence, the best way to explain how to reorganize transportation authority is to analyze the continuing frustrations to modernize the connectivity and capacity of central stations. Terminals are our brick-and-mortar microcosms to redo the pieces of daily transportation so we unclog roads and raise household savings. These microcosms help us put the pieces back together. A proper through-station is the engineer’s prototype to test greater capacity. It also is the reformers’ example of how to change backward commuting behavior. As a multi-benefit response to the increasingly posed equity equation, trains save households money and redevelop sub-centers. As we build momentum to break out of transportation’s late 20th Century spider-web, the most hopeful lessons in evolving metropolitan policy come from our modest successes in station updates. Where those systems converge, we create mode synergy that spreads. 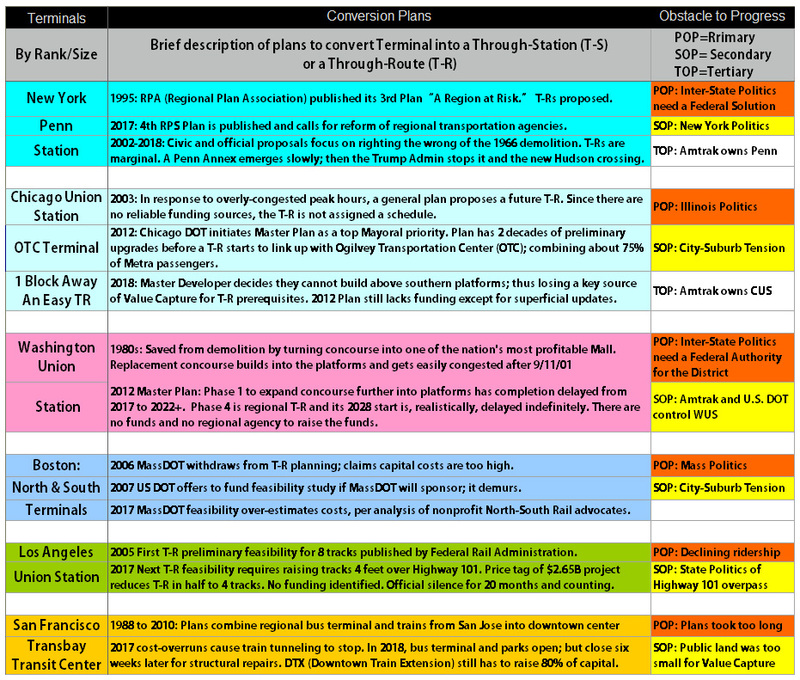 From the coming six chapters, this Preview cites some central station positives and also details how to modernize each system so it also redevelops sub-regional TOD. For those who only have time for the double-short version, here are how the next six chapters illustrate the problems and solutions to evolve metropolitan transportation. 1) Philadelphia Center City through-stations were made mostly by municipal moxie. Center City redeveloped robustly near those three stations whose location is obvious in the above photo. Conversely obvious, sub-regional centers have benefited little from rails; despite there being 147 other stations. Ridership is only 10% above 1970s levels during bankruptcy. Pennsylvania’s legislature has been increasingly hostile to Philly utilizing its train tools. Lesson: the benefits of a through-system don’t grow unless the state allows the system to modernize and redevelop sub-regional centers. 2) The Twin Cities represent American metros’ most common pattern. This county-based transit build-out is analyzed to see how they and others can evolve. Having harvested the low-hanging fruit of a new network and two central stations, Twin Cities transit has clear growth limits (particularly for trains) under the current multi-county, legislative-meddled, governor-appointed regional council. Lesson: metro governance needs broader authority created by more democracy. 3) The antidote is obvious in Denver’s elected Regional Transportation District. The RTD produced the nation’s best transit progress recently. But one decade ago, it was stuck in a fiscal crisis that would have killed the promise of trains. So this Board, accountable to taxpayers, innovated and opened four commuter lines. The airport line exceeded goals in its first year; pleasing passengers and private partners. They rapidly are transforming around Union Station and a few suburban stops. Lesson: more democracy yields transportation progress, prosperity and property tax revenue. 4) SF’s failure to bring trains downtown proves only metro authority can improve trains significantly. While the San Francisco Bay Area (above) has our best transit west of Manhattan, Caltrain failed to achieve this regional priority of connecting downtown SF to the Silicon Valley. SF also represents the nation’s fumbling trend to fund transit by collecting from landowners who benefit most (called Value Capture or VC.) SF offers a cautionary tale to every city that VC cannot replace significant public capital unless this new tax is legitimized by effective, re-structured agencies. 5) Making VC work for SF is part of a new deal for the Caltrain Corridor. While suburban TOD has grown and San Jose’s Google campus could be a breakthrough, the real opportunity is to reorganize the Corridor’s transportation so it is as intelligent as the industries it serves. To avoid the county-based resistance, this proposal is corridor-based and encourages PPPs to redevelop the corridor and grow ridership. 6) The LA region struggles to use rails to reduce car congestion. While California’s devolution of authority happens faster in its north, LA has great potential to use trains as a mobility alternative in America’s most sprawled metropolis. This requires getting past the region’s Edifice Complex for central stations and resetting transportation economics so commuters use cars less. This chapter proposes California’s further devolution and gives multi-metro states — such as Texas and Florida — a hopeful prototype. To conclude these six chapters, transportation authority can rebalance from states to metros. By analogy, we have precedent for states creating authority at lower levels. When rapid industrialization required giving municipalities authority to segregate uses, 1926 documents show this emanated from Commerce Secretary Herbert Hoover and spread quickly as a ‘de facto’ federal policy. While this was consensus for the 20th Century, our unintended consequences today of segregated uses is they add to unnecessary congestion. Until mixed uses start to become a suburban norm (which will take many decades), trains can relieve road-stress in the short-term and accelerate mixed-use suburban centers in the mid-term. And all this gets sped-up if federal policy helps devolve state power to shape an elected metropolitan body politic for transportation as a test to solve these entrenched problems. The NEC is ripe for that test. Updating Uncle Sam’s funding incentives could give sufficient guidance so legacy trains are modernized for this era. Federal grants could be contingent on transferring state authority to an elected metropolitan council which, in turn, can tax to pay for the huge backlog for a “state of good repair” and, then, real improvements. In each remaining station’s chapter, our goal is to expand the policy discussion and remind Congress that commuters are the primary passengers in the same stations the NEC uses. And whether or not Congress permits the deal to privatize NEC operations, commuters still need a new deal so multi-state metros can reorganize trains and use them properly to move the nation forward for the coming era. 7) DC Union Station can send this message: dysfunction does not reign. To reorganize this multi-state metro and utilize one of the best methods to reduce stress on its subway, this chapter proposes a Capital Region Transportation Authority. CRTA’s focus is strategic investments. One connects Maryland’s commuter system to Virginia’s by converting DCUS into a through-station. 8) Baltimore’s Penn Station does not serve this struggling downtown; but it can get service. By extending the CRTA, our proposal gives Baltimore and the NEC what they need: a passenger tunnel downtown that also fixes the NEC bottle-neck. This CRTA extension also becomes a modular prototype to extend the CRTA south to Richmond and, in this season of hope, re-unite the nation’s two halves ! 9) Boston suffers Big Dig-phobia. Uncle Sam should help dig the tunnel to convert Boston terminals into through-stations and make New England’s true transit hub. Massachusetts apparently lacks the political authority for a multi-decade integration of the commuter network. 10) NYC’s “new” Penn Station is a terminal and will do little to increase capacity. Dysfunction imposed by state agencies not only has hugely endangered the region’s economy with probable tunnel failure, the failure to convert Penn to a through-station also causes Grand Central Terminal’s capacity to be underutilized. Thus, our proposal uses Uncle Sam to do what advocates have talked about for decades; but, have not got government to respond. Congress should help set up a regional authority to make two tunnels through Manhattan proposed by advocates. First, the new Gateway should be extended to Grand Central and, then, to Jamaica. Second, Atlantic Terminal should be connected to downtown Brooklyn, then lower Manhattan/Fulton and on to Newark. This will relieve stress on Manhattan’s congested subways and network several sub-regional centers. 11) My native Chicagoland gets the most radical proposal. Because its state is broke, discredited, endlessly corrupted and has breached so badly the social contract, this requires a federal takeover of metropolitan trains that, then, sets up an authority called TRIB, the Taxpayers Regional Investment Board. One of TRIB’s jobs will connect three of the above terminals with twelve lines into one network that increases train capacity, reduces Chicagoland’s persistent car congestion, redevelops lagging sections of Cook County, connects the region’s six airports and, generally, modernizes commuter service to the point that the nation’s freight rail center can truly say that it knows how to treat its taxpayers and passengers better than cattle. Because Illinois has too long assumed its taxpayers are willingly pliant, its recurring fiscal emergencies are really the result of a latent tax strike. To end that strike, the legislature will have to make the TRIB an elected authority. 12) What is Uncle Sam’s Big Picture? Try this analogy. Possibly The Union’s greatest feel-good moment after the Civil War and lasting into the 20th Century was Uncle Sam’s stimulant that laid transcontinental rails (see commemorative stamp below.) This served us hugely well through the 1940s and, then, declined precipitously in the auto age. As we seek efficient ways to move people through a metro, today’s rail stimulant will use trains to help re-organize regional mobility. But, our regime of 50 state DOTs interferes with national progress. Sustainable mobility will always fall short if metros cannot employ its public or private sector to run trains to reduce congestion. As part of a reconstructed American Deal, mobility also needs to help families grow savings since many increasingly can no longer afford multiple cars and large lot homes. Within our nation’s principles, we can meld entrepreneurial solutions so trains redevelop TOD, help diversify mobility alternatives and reverse economic decline in too many households. But to achieve these ambitious goals and shape elected metropolitan agencies that can evolve sustainable transportation, Uncle Sam must help rearrange the “pecking” order (see October post) of agricultural era governments and minimize interference by states and their surrogate counties. Uncle Sam’s first steps are MPO reform and performance-based capital funding; both talked about, but barely starting. Next steps are detailed in #12. Furthermore, #12 suggests how the constitutional commerce clause can help shape multi-state authorities for the metros along the NEC. And if that works, then adapt those authorities to remake Chicagoland’s radiant lines into a network of sub-centers. Odd, isn’t it… that the 19th Century technology that wove states into a national economic unit can now be used to rationalize metros into units for the global economy.